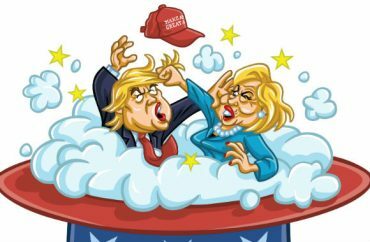 ST. LOUIS – Outside Sunday night’s presidential debate between Republican nominee Donald Trump and Democratic nominee Hillary Clinton at Washington University (WUSTL), an unexpected group came to heckle the New York businessman: conservative students. Like a handful of College Republicans chapters across the country, the WUSTL chapter has refused to endorse the Republican nominee. But it’s not staying silent, displaying a sign reading “Trump scares us too!” outside the debate auditorium. The defections from Trump by chapters at Cornell, Harvard and the University of Connecticut appeared to be isolated incidents before a recording of 11-year-old lewd comments by Trump was made public Friday. Those remarks led Alex Smith, president of the College Republicans National Committee, to declare Saturday there was no place for Trump in the Republican Party. The Party of Lincoln is not a locker room, and there is no place for people who think it is. Definitely not with her, but not with him. On the same day, the New Mexico Federation of College Republicans formally announced their support for Libertarian nominee Gary Johnson, the two-term former Republican governor of their state. Johnson has been a frequent beneficiary of distaste for Trump among CRs. Davis voted for Johnson, the Libertarian, and his decision has been controversial among former donors and the state board of his organization. Like their favored candidate, Trump-supporting students are denouncing the non-endorsers. Clubs and individuals that decline to endorse the Republican nominee should be removed from the party, Sean Rock, former Missouri deputy director of Students for Trump, told The Fix. “Any ‘Republican’ disavowing Trump or voting for Clinton or Johnson is a disgrace. They are ignoring the will of the People,” Rock said in a Facebook message. He believes that Friday’s video of Trump’s lewd remarks from 2005 was a planned event to draw attention away from nominee Clinton’s persistent scandals. “While what Trump said may not be kosher, it is nothing compared to what Hillary has said and done,” Rock continued, referencing her husband Bill Clinton’s alleged victims of sexual misconduct. Without the CRs’ help, pro-Trump students ended up holding their own “Deplorables for Trump” rally for the debate, according to the St. Louis Post-Dispatch. The title refers to Hillary Clinton’s comment about Trump supporters being in a “basket of deplorables” – a slur they have embraced. Publicly supporting Trump on campus has proven perilous for many students, including the University of California-Berkeley CRs, the DePaul University CRs, a student at Gustavus Adolphus College and many more. Jeremy Wiggins, a national delegate for Trump, told The Fix that he considered the WUSTL rally to be a success. EDITOR’S NOTE: The author is the former treasurer of the University of Missouri College Republicans.